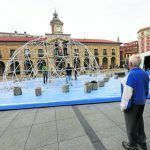 Geodomes Immersive Experiences installs in the Plaza de España of Avilés its model G75 on the occasion of Juvenia 2017. From the geodesic dome located in the Plaza de España, where you can enjoy the 360º Fulldome video ‘The universe of stamps’, which reviews the history of the Post Office, to the different thematic series of stamps (5,100), which have launched since the first, reigning Isabel II, in the mid-nineteenth century. Because, as Modesto Fraguas says, stamps are more than just a little stamp, because “they bring together five values: innovation, knowledge, history, communication and collecting. And although its use is decreasing, it grows as a collector”. Philately, stamp collecting and everything related to them, has 60 million fans all over the planet. In Spain, one hundred thousand people follow the novelties of this global ‘world’ on a regular basis. A few, numerous, are avilesinos, where the tradition is long, so much so that the town became one of the points of the country with the largest sale in the last decades of the last century. Unbeatable precedents for having been chosen to host the fair Juvenia, an international benchmark, in its XXV edition, organized by the Avilesino Philatelic Group and the Spanish Federation of Philatelic Societies (FESOFI) with the invaluable collaboration and sponsorship of Post. In order to commemorate it, a stamp was put long, in whose image is represented the consistory avilesino, with vivid colors, ‘graffitied’. Thus, until Saturday, Avilés will be the centre of the philatelic universe. Juvenia is part of the youth collection, seeks a stimulating effect and rejuvenate the fans. It was presented yesterday in the City Hall, with the presence, among others, of the mayor of Avilés, Mariví Monteserín; Modesto Fraguas, director of Filatelia de Correos; Ángel Pérez, director of the Northwest Zone of Correos; Miguel Ángel García Fernández, president of the Spanish Federation of Philatelic Societies, or José Ramón Rumoroso, president of the Grupo Filatélico Avilesino. They were pleased to see the city turned into a pole of national attention in international. As the mayoress said, “Juvenia is an exhibition that helps to bring young people the concern for an activity that infuses important values to those who practice it. 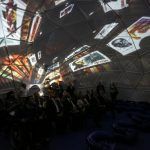 The geodesic pavilion is undoubtedly an essential element for making immersive fulldome projections. Geodomes Immersive Experiences has models from 30 to 515m2, such as the 75m2 geodesic pavilion installed in Avilés to carry out fulldome projections.